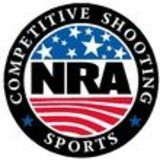 NRA/USA 50) is used, only one (1) shot per bull is allowed. Note: Course shown above is full course; however, league sponsors may fire reduced number of shots, i.e., (10 shots each position), if desired. Time may be reduced from above, but not less than 1½ minutes per shot. Changeover time between positions up to 15 minutes. Target: 300 meters – C-1; 300 yards – C-3; 200 yards – C-2. 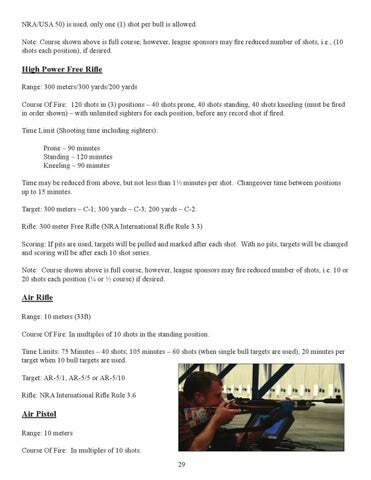 Rifle: 300 meter Free Rifle (NRA International Rifle Rule 3.3) Scoring: If pits are used, targets will be pulled and marked after each shot. With no pits, targets will be changed and scoring will be after each 10 shot series. Note: Course shown above is full course, however, league sponsors may fire reduced number of shots, i.e. 10 or 20 shots each position (¼ or ½ course) if desired.